We arrived in Berwick upon Tweed by 10pm last night ready to take photos and sort final details for course next week. Today started around Berwick while we waited for the tide to clear the causeway to Lindisfarne. Nice light, clear as a bell too. Photos around the old fortress and down on the beach. Lindisfarne is about 20 minutes from Berwick and the causeway must be a bit under a mile long. First stop was the harbour with the huts made from upturned boats a bit before midday. Always good for pictures. Lots of lobster pots too for pattern pictures. Best view of all was across to Lindisfarne Castle with blue sky and white fluffy clouds above. 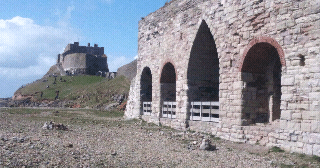 Then past the castle to the lime kilns (in photo) for pictures back to the castle. From here we walked round the coast north to the sand dunes then round and back to the village for a break at the Ship Inn for a pint of Blessed Bitter. It was nearly 3pm by now so just crisps for lunch, too late for anything else. A good time for a break as the light had long gone. A quick stroll around the village and we ended up at the jolly friendly Crown and Anchor for a pint of Sacred Kingdom. After all of these delaying tactics the sun had returned so we went back to the harbour via the Priory. The light was now on the other side of the huts, boats and lobster pots. This made for excellent foregrounds for shots of the castle. Back to the car and a short drive to the dunes at the Snook just before the causeway. The sea was a long way out so no photos. Stopped at a beach near Berwick on the way back for shots of the waves racing in over what looked like limestone pavement. It was 6.30pm now, the light was pretty much gone so time to return to Berwick for food at Wetherspoons. Tally for the day: 7 rolls of Ilford FP4 film making 70 negatives in total using my Mamiya 7 camera, mostly with an orange filter to darken the clear blue sky. Unusually for me I took lots with the standard lens (80mm) rather than my more favoured wide angle (43mm). I didn’t want to reduce the size of my subjects by pushing them too far back in the pictures. Hope the weather holds tomorrow as we head south for some coastal castle shots.